The Mullet was very popular in the 80's. 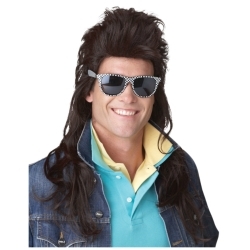 With the 80's parties becoming increasingly popular, this wig will save you from having to grow a real mullet. The 80's rock mullet wig is colored as pictured. Wig is one size fits most using an elastic sizing band on the inside of the wig.